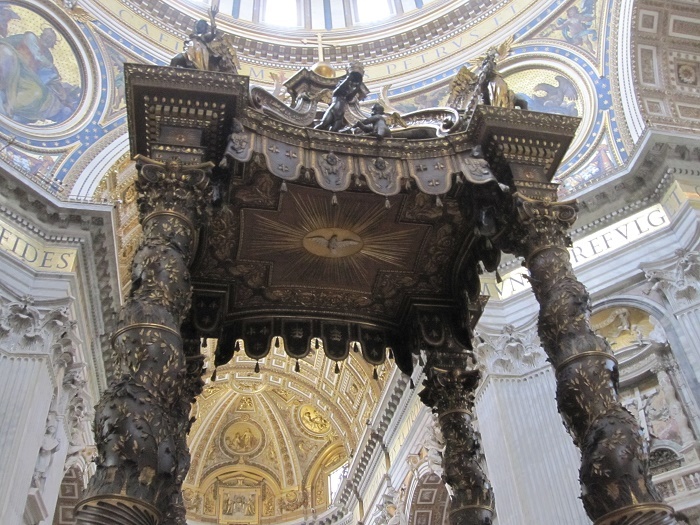 St. Peter’s Baldachin is a large Baroque sculpted bronze canopy, technically called a ciborium or baldachin, over the high altar of St. Peter’s Basilica in the Vatican City. 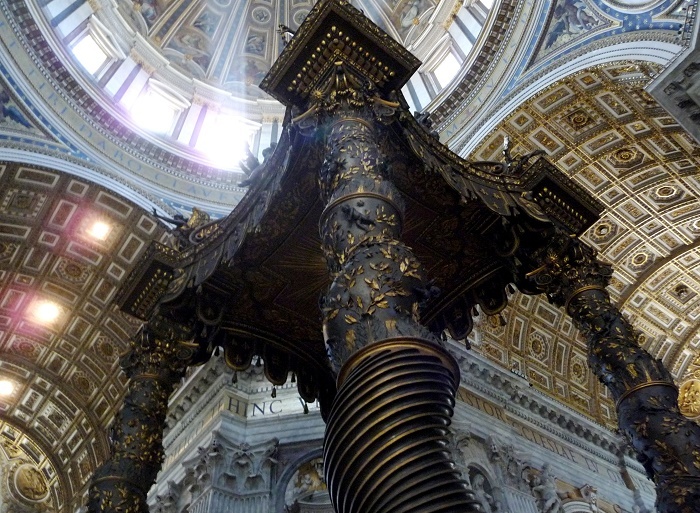 The baldachin is at the centre of the crossing and directly under the dome of the basilica. 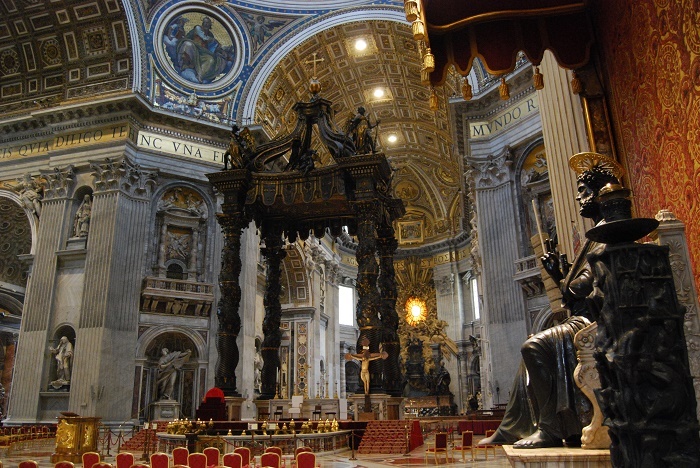 Designed by the Italian artist Gian Lorenzo Bernini, it was intended to mark, in a monumental way, the place of Saint Peter’s tomb underneath. 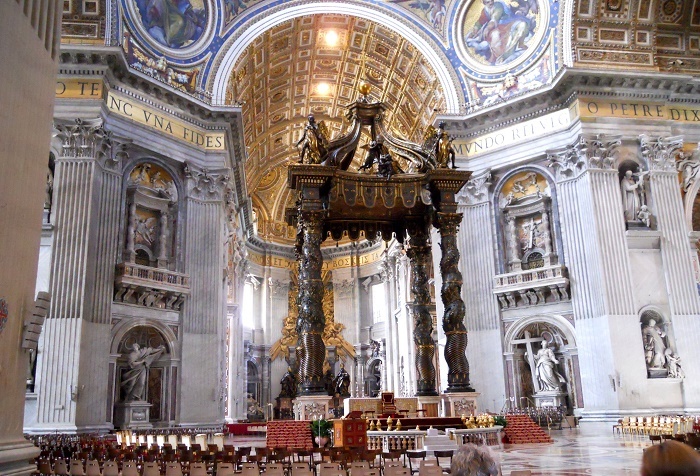 Under its canopy is the high altar of the basilica. 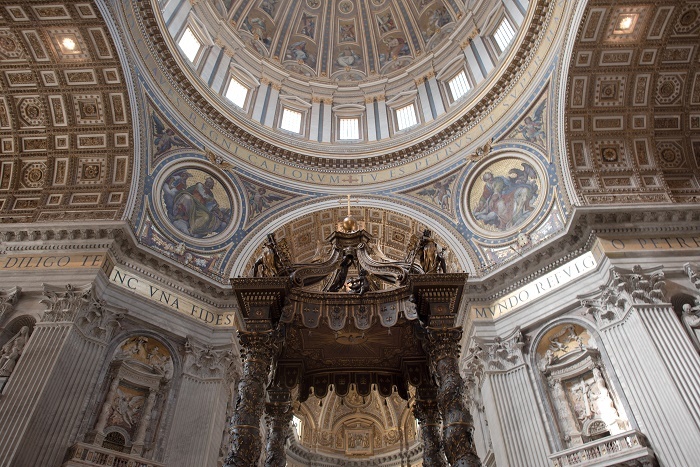 Commissioned by Pope Urban VIII, the work began in 1623 and ended in 1634. 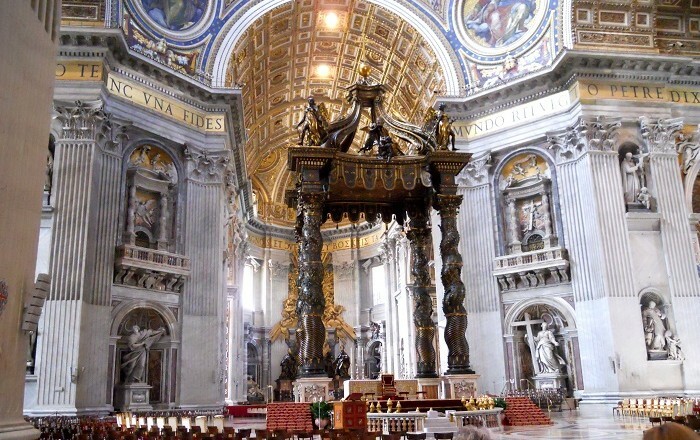 The baldachin acts as a visual focus within the basilica; it itself is a very large structure and forms a visual mediation between the enormous scale of the building and the human scale of the people officiating at the religious ceremonies at the papal altar beneath its canopy. 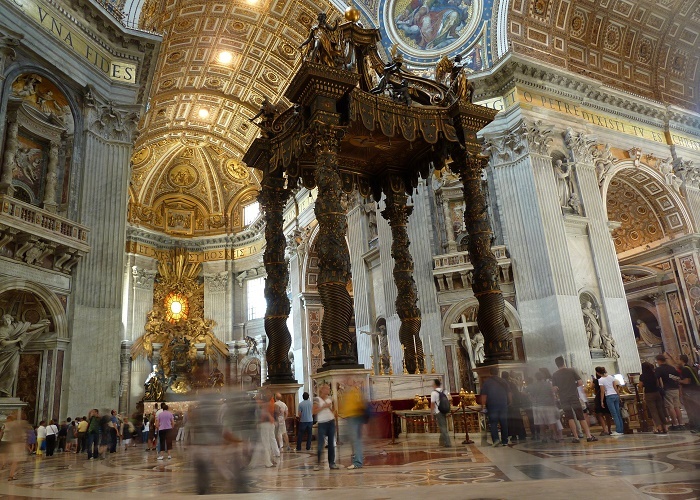 The canopy rests upon four helical columns each of which stands on a high marble plinth. 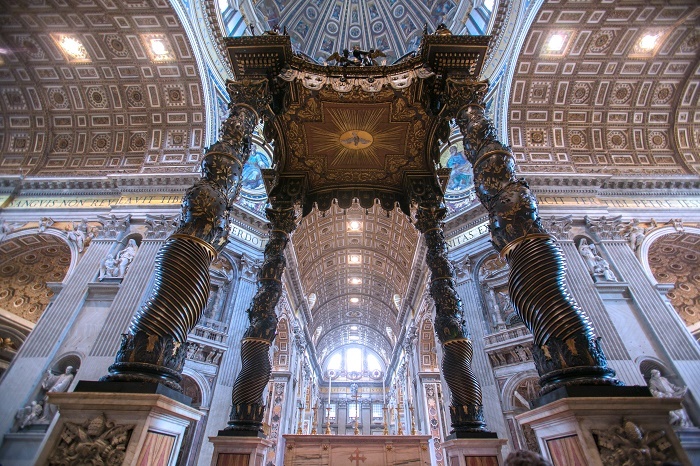 The columns support a cornice which curves inwards in the middle of each side. 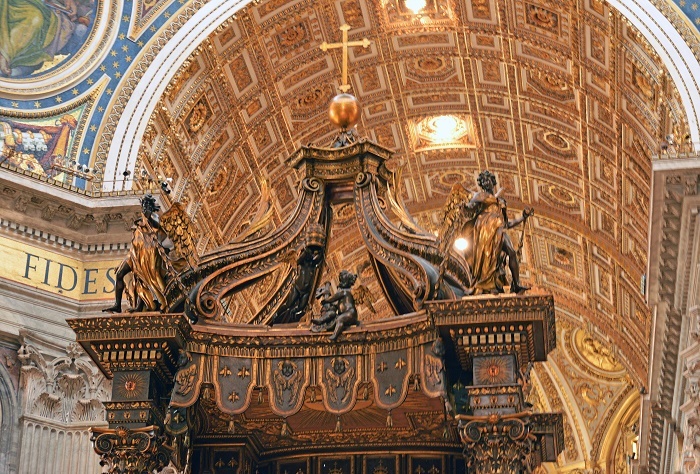 Above this, four twice life size angels stand at the corners behind whom four large volutes rise up to a second smaller cornice which in turn supports the gilded cross on a sphere, a symbol of the world redeemed by Christianity. The four columns are 20 meters (66 feet). 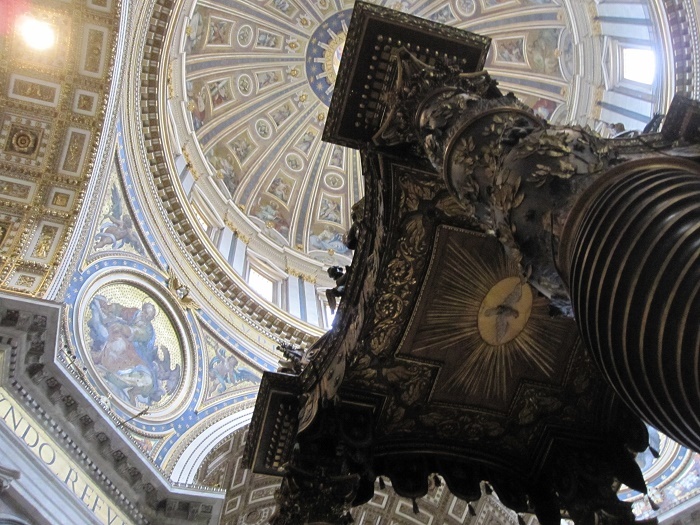 From the cornice hangs a bronze semblance of the scalloped and tasselled border that typically trimmed the papal baldacchino. The structure is decorated with detailed motifs including heraldic emblems of the Barberini family (Urban VIII was born Maffeo Barberini) such as bees and laurel leaves. 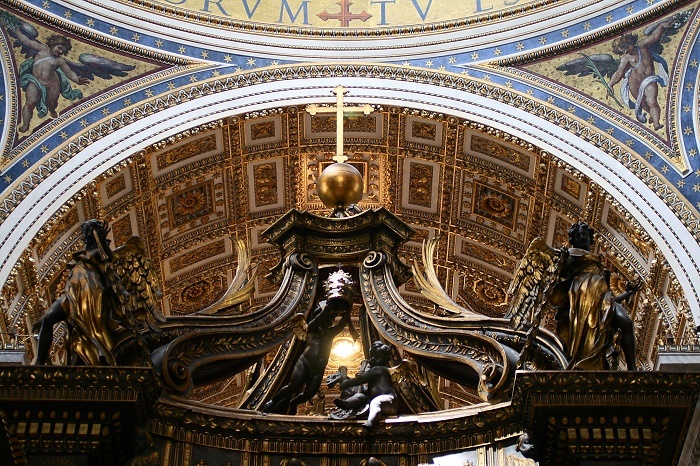 The underside of the canopy and directly above the officiating pope is a radiant sun – another emblem of the Barberini – within which is the Holy Spirit.